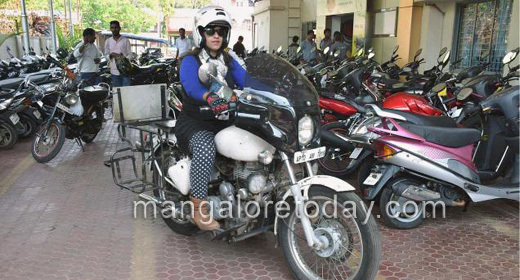 Udupi, March 8, 2016 : Sana Iqbal of Hyderabad, who is on this mission on her bike, reached Udupi on Mar 7, Monday and was met by many. She has chosen a unique way to create awareness against depression and prevent suicide. She shared information that she started her special journey on November 23, 2015 from Goa and has covered a distance of 17,000 kms so far visiting more than 47 cities, including Delhi and Mumbai. The journey will culminate at Hyderabad by the end of May, she added. Sana also plans to open a counseling centre after her sojourn. Sana is a postgraduate in Psychology, said the shocking increase in the number of depression patients and suicide victims motivated her to create awareness on this condition. She chose to fulfil her objective while she rode on her bike to cities across the country. She has been moving within the country and conducting discussions. She said, "Increase in workload among private company employees is the main reason for depression, which in turn leads to suicidal tendencies. Creating awareness on how depression can spoil lives is necessary and suicide is not the solution to any problem. I have interacted with students of 80 colleges regarding this issue." She said her parents, both advocates based in Hyderabad, were initially reluctant with the idea, but later on agreed to support her. Sana said she has spent about Rs 6 lakh to accomplish this ride. “Many students have talked to me with an open mind and shared their problems,” she said. Sana Iqbal added that she had been interested in motorcycle riding since a young age. It later became a passion with her. “I ride about 350 to 500 km a day,” she stated. We support your ideals. Your passion has to be a lesson to many. Take your spirit as a challenge for life. Suicide is not the end of life Your right Sana . Especially the youths come to depression and end up life. We have to join hands to put ans end to such. Every individual has his or her own way of thinking but this is something different . There are few who hardly spend time for others problems . Great Going . Wish you a safe journey. A daring woman like her spirit. Hats Off. If everyone rise up with this we can make our nation the best. Its a wonderful awareness initiative by Sana. We ave to take a stand in every step of life and drive away the thought of Suicide from the even the corners of the minds.